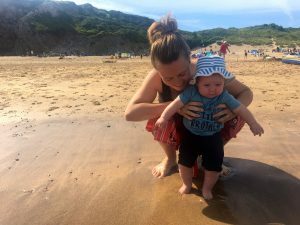 If you read my Summer Holiday Bucket List then you’ll know that one of the things we wanted to do was have a mini stay-cation. Well, as things happened we actually had a few stay-cations! We had a couple of days in Manchester, Lowestoft and Great Yarmouth and then a week away with Dan’s parents in Pembrokeshire. We rented a cute little Airbnb place just minutes from the stunning Pembrokeshire Coastal paths. Being in Pembrokeshire there were numerous beaches were could have picked for a beach day. Nearby there was Tenby, Barafundle, Saundersfoot to name just a few. We were even walking distance (just) from Freshwater West, a popular beach for surfers! We were spoilt for choice. Unfortunately we picked a Bank Holiday Saturday to head to the beach, so it was picked for us due to car parking restrictions. However, I now couldn’t recommend Broadhaven Beach more. It was sandy, picturesque and perfect for paddling. We had a lovely afternoon in the sunshine. 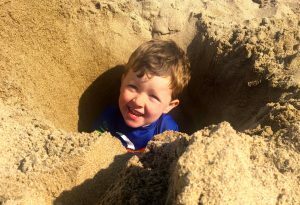 We dug a hole as big as Alfie, we built sandcastles and we sunbathed. Alfie and Daddy even went swimming in the sea! Eli and I had a little paddle too. It was a bit too cold for him though. Our Me and Mine Project photos for August were from our sunset beach walk. It had been a miserable afternoon, torrential rain and yet it was followed by the most perfect sunset. 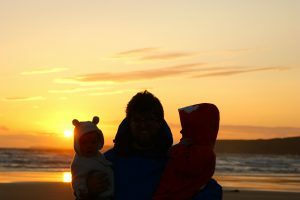 There is just something about letting the boys stay up late, basking in the fun of a holiday adventure and walking along the beach in the evening. If it had been 15 degrees warmer it would have felt like we were abroad! Since having Eli, and losing weight, I really enjoy going for a walk. Plus the pembrokeshire coast is a walkers dream. 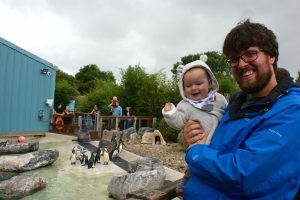 Folly Farm is a must, if you are visiting Pembrokeshire, with children of any age. There is the Zoo, the Farm, the rides, the diggers and the play areas. It’s everything you could need to entertain them, but all in one place. We took Alfie to Folly Farm at the same age Eli was. It was interesting going back with Alfie being 3 years older and with a baby again. Our favourites were the penguins! They all had tags on and the colours of the tags showed you which one was which. There were two that were called Jelly Tot and Bon Bon which Alfie and I loved! Another favourite were the Giraffe’s. 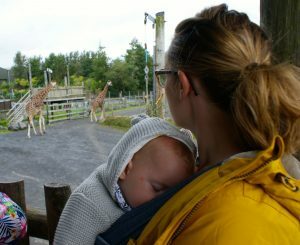 I have such strong memories of Alfie being up close to a Giraffe at Folly Farm. Unfortunately Eli wasn’t as excited as I was and he fell asleep, both times we went to see them! We made sure that throughout the week we treated ourselves to an ice cream or two and fish and chips. I mean it’s not a trip to the seaside unless you’ve had fish and chips is it?! Pembrokeshire is definitely somewhere we’d like to visit again! If you’ve been to Pembrokeshire where would you recommend us visiting?